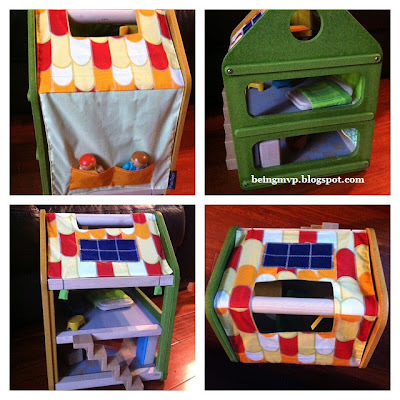 Imaginative tots and playhouses seem to go hand in hand. Kenzie is thoroughly enjoying her dollhouse from Imagine Toys but when The Play House arrived, she was all over it. This house is made by Plan Toys and is eco-friendly and perfect for small spaces. The assembly process took minimal time and Kenzie was ready to set up house in no time. There are three floors in this house with a flight of stairs that attached to one side. The carry handle on top as well as the dual-purpose mat make it great for storing and clean up time. The house is made of nontoxic reclaimed rubber wood particles & formaldehyde-free glue with water-based colors which appeals to both boys and girls. The colors are created using organic pigment in an earth-friendly process which results in a stain resistant and washable "toy" making it practical for little ones. There are two dolls included (a male and female). They have hinges which allow them to stand and sit. Kenzie had a blast making them sit/stand so much so that the thread keeping the two parts together is starting to go bare. The mat is fantastic as it can be used as a cover for the house as well as a play mat that is used as an extended play surface. It includes living room, dining room, bathroom and bedroom furniture. It truly is a perfect house. Without any direction from me, Kenzie started setting up house. It is the cutest thing and brings smiles upon our faces when she "plays house". She loves the natural wood pieces and even tried to sit on the little chair herself. Needless to say her bum had an "ouchy". The fridge gets the most use as Kenzie's snack container. She likes to put nuts in it from daddy's jar, close, then shake. I admit I'm not a fan of this as I don't like food/toys to mix but at least it's not wet foods plus the set (I must mention again) is washable! Kenzie plays with her play house everyday and even talks to the people. I have to get her some additional accessories for her house such as pets and patio furniture. Imagine Toys has a wonderful selection for gift giving this holiday season. It's an easy to maneuver site with a toy for every possible wishlist. Their selection of personalized toys is so sweet - Home Sweet Tent will be perfect for Mason once he gets older. You can also pick up a gift card for the gift recipient to let them browse the wonderful toys and choose. Buy It: You can purchase The Play House for $79.95. Make sure to connect with Imagine Toys on Facebook, Twitter & Pinterest! 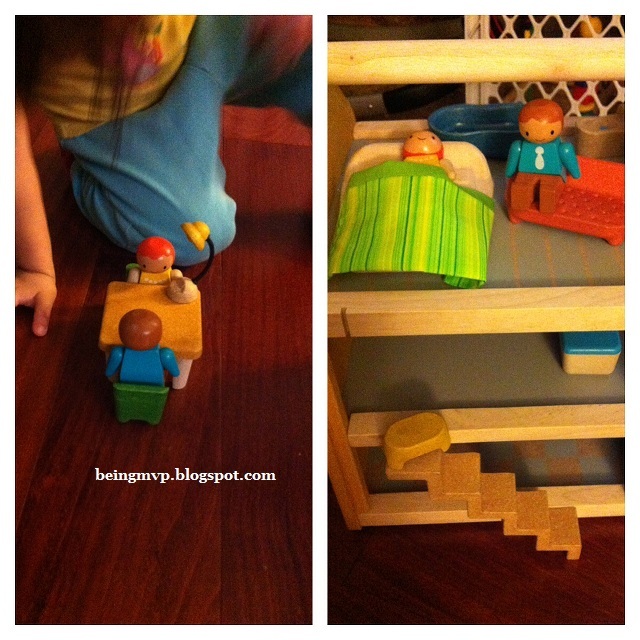 One Winner will Receive The Play House from Imagine Toys! My kids would love the doll house, but they would also love the cash register or the tablet. I also like the Creative Peg Puzzle. I also like the Tegu blocks. I think my daughter would love them and they are so unique. I like the Airport in a Box. I also love the Dyna City! I like the A to Z Uppercase and Lowercase Magnatabs. Love the Let's Go Shopping Cart! So realistic! i love the funky gears shape sorter! I would love to get my granddaughter the Color & Sound Blocks. My daughter would also like the Archiquest Deluxe World Fusion Block Set. Rock n roll doggy looks like fun! I love the Shoot Again Basketball. I would also love to have their Green Gourmet Kitchen. I love their stuff! I like the pop up toaster and the cash register. I would like the The Little Ride On Recycling Truck from WonderWorld. I like the Fly Me To The Moon Rocket. I love the Cuppa Joe wooden toy coffeemaker. I also like the Fun and Play Tablet. I love the Airport in a Box! The wooden coffee maker would be perfect for our new kitchen. The Airport in a Box is pretty cool. I like the ride on Zebra. I also love the Tegu blocks. I like the Rollin' Safari. My son would like the Cannibal Monsters game. The Enchanted Tales Play Set looks very nice!